Quiltville's Quips & Snips!! : Galaxy-Gram! A glimpse from today! Here it is 7:25 p.m. And we are done with dinner together for this group of seven people. It just hit me that I have not sent anything this evening up to the blog, and I am posting a couple of photos just so you have an idea of what went on around here today. 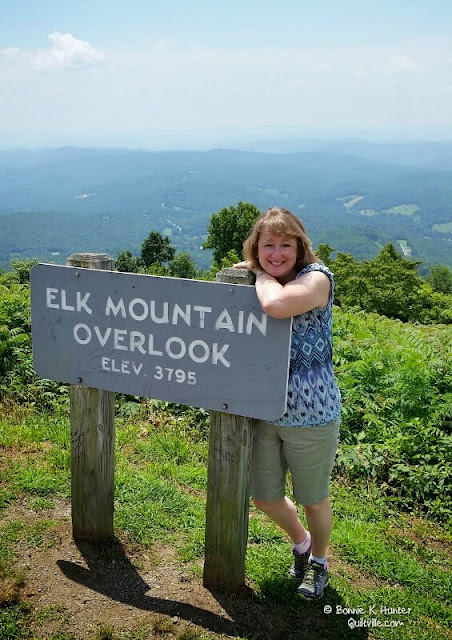 I also appeared on Pat Sloan's radio show this afternoon, having just arrived home from a road trip on to the Blue Ridge Parkway and some hiking down to some waterfalls. Those photos will appear tomorrow morning. 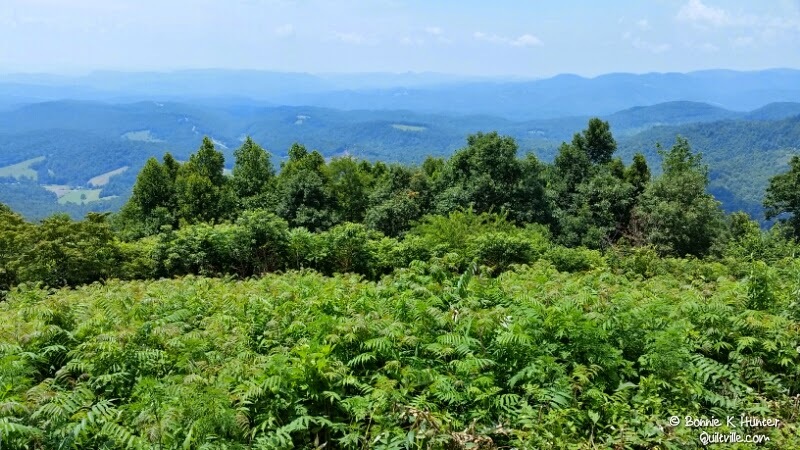 The overlook along the Blue Ridge Parkway is stunning, and I am happy to share my favorite place on Earth with you. 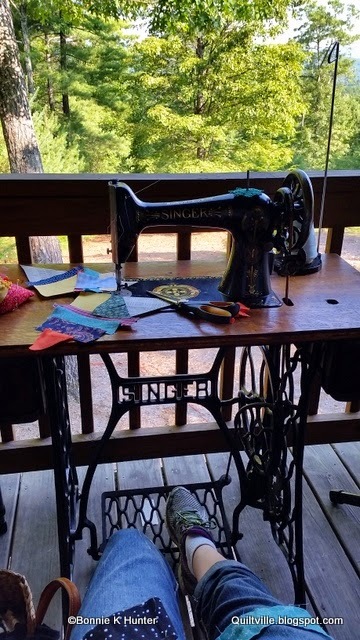 The morning was cool enough that I also pulled the treadle machine out on to the front porch for some lazy stitching while enjoying the view. The excitement for another family round of farkle is building, the stakes are high and promises to be a lot of fun. Somewhere I have a picture of that sign. I have enjoyed by trips through Western North Carolina. HA!! I play Farkle online! Have you ever played right, left, center? LOVE that one, too! Frackle, what is the game and how do you play it? Love the photos, especially the one with you in it...you look SOOOO rested! Wow, what fabulous view, no wonder you love it. You really do look to be enjoying your down time with precious family. You deserve it. Just love it Bonnie - not posting in the evening means you truly are relaxed and enjoying your time off. So enjoy! Bonnie, sometime soon could you post an update on the Gluten free diet and your results personally? Just wondering and I have some chronic pain with arthritis and bursitis. TIA as usual. THANK GOODNESS for Bonnie K Hunter's quiltie ways. While I am a confirmed scrap quilter it is fun to poke around and see what other designers and authors are doing. I enjoy seeing one particular designer's quilts ... decide to visit her blog and facebook page! This then set me on a trail. Others are so set on selling fabric lines, threads companies wares, Accuquilt dies etc. etc. etc. that I actually was getting angry with them. Of course this is their own personal choice. I choose to leave the blogs and facebook pages. I posted the same above in facebook. BONNIE IS TOPS!!!! She is the real deal! love the pix and your hikes !! please explain Farkle for those of us that are not familiar . .
OMG, Farkle is the most funnest game, but in my house you have to sit in the green recliner if you want to win! LOL. Farkle is a dice game that's kind of like Yahtzee but not. It's about $5-$6 and not difficult to learn, so get it and play it, it's fun! And Bonnie, shame on you for showing how you can play outside when the rest of us in Houston TX can't cuz we have to deal with horrible heat and nasty humidity! I'm so jealous of your view! Seriously, am happy for you, and would love a change of scenery now and then.